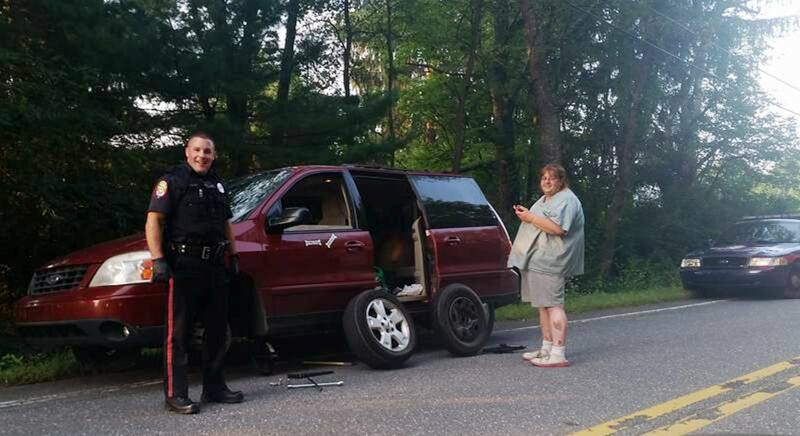 Pictured is a submitted photo of a Summit Hill Police officer Jason Harrison helping a stranded motorist replace a flat tire on Lentz’s Trail. “This is the type of thing that makes me proud and restores my faith in humanity,” said Scott Reese on Facebook. Click HERE to view a later story in the Times News. I happen to be the one he helped. And let me tell you this fine police officer went above and beyond to help me. He not only changed my tire for me but he also called a friend to put air in my tire that he put on and because my four ways were on the whole time which killed my battery he also had same friend jump start my van. So for that I am deeply grateful to both of them. Oh the officer also followed me half way home to make sure I was safe. Thank you once again for going above and beyond your call of duty. 😊.